AN Dry Air Cleaners - Vortox Air Technology, Inc.
AN style air cleaners are a single stage design which minimizes restriction and maximizes air flow and performance. AN air cleaners are used in moderately dusty environments where a multistage air cleaner is not required. Most models are designed for outdoor use and can be mounted horizontally or vertically. AN styles are constructed of either Electro Galvanized Carbon Steel or T304 Stainless Steel, depending on model and usage. Rigid and durable steel construction provides long life and years of continuous service to the on-highway, stationary engine, industrial, compressor, generator set, and irrigation industries among others. 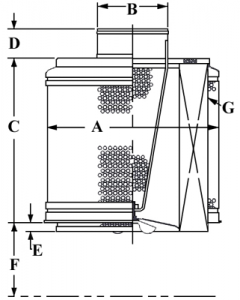 Select AN styles are made to accept Vortox Air Technology Inlet Caps, which remove large debris in the air and serve as a shield against rain. 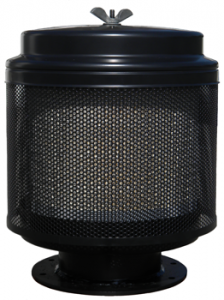 Other AN style air cleaners have inlet cap/screen protection built into the air cleaner design. Additionally, all air cleaners can be mounted using our BB style Band Brackets.